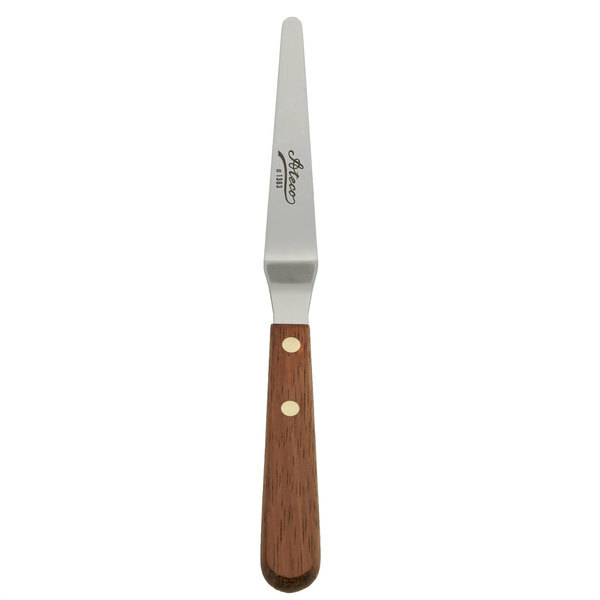 Perfect any creation with this Ateco 1383 tapered offset spatula! Frost any cake and easily smooth any hard to reach icing flaws with this 5" spatula precision blade. With a natural wood handle and a tapered stainless steel blade, this spatula allows for precise edging on frosted desserts. Because the blade is slightly bent, you can easily round corners and follow the natural form of round cupcakes and tiered cakes to evenly distribute icing. With the proper tools for each task in the kitchen, you can create professional, appetizing desserts that are sure to catch your customers' attention! It is great for making designs on fondant, detailed icing work, removing cakes from decorating turn tables, or removing tarts from muffin pans. Maximum Blade Width: 1 1/16"
This icing spatula is a good price and good quality. It was delivered quickly and was packaged well. I would buy again if I needed another one. This tapered offset baking icing spatula with a 5" blade is a must have for anyone who loves to bake. great for placing fondant figures, as well as smoothing the surface around hard to reach spots. Of course we use this tool for its intended purpose, but also for loosening cake sides from the pan. So, it’s not just for icing! I was looking for a nice small spatula to help me smooth some of the small places of my cakes that i can't get to easily. This spatula is perfect for that. Love it. Good quality. Love the wood handle too. I love the quality of all ateco products. The wood handle on these spatulas feels really nice while working with it. 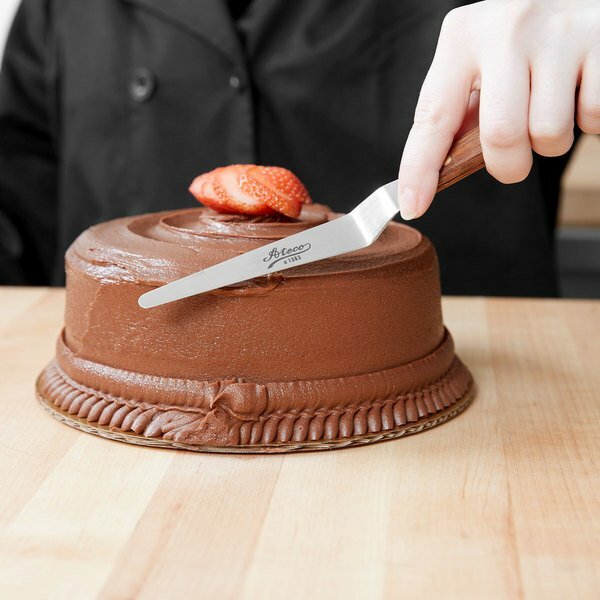 The tapered spatula is perfect for sculpted cakes and tight spaces. 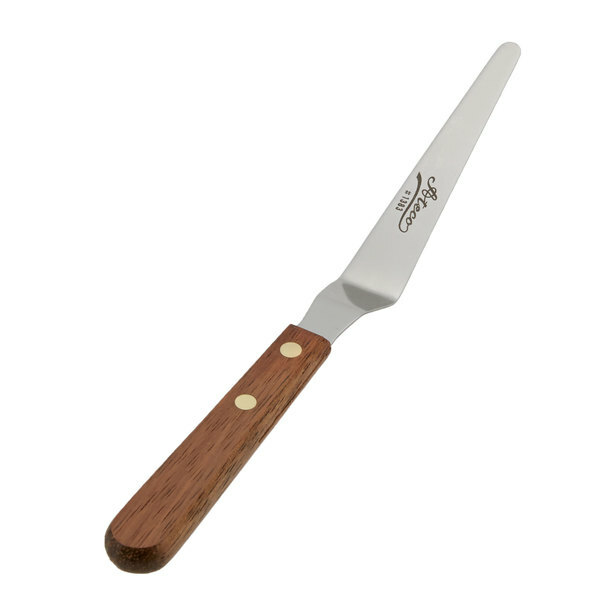 The wood handle is a joy to hold and the blade is extremely flexible. The tapered blade is fantastic for detailed icing work. Highly recommended! One of my favorite ways to use this tool, is actually for indentations in my fondant! Don't get me wrong, it is an excellent tool for smoothing small and hard to get to areas on a cake, especially the areas right around a newly place fondant figure or flower. But, I really love the designs I get by using the tip of this spatula for indentations. especially on my fondant mermaid tails. It produces excellent and very realistic scales. Love using this spatula to release cakes from the turntable after icing. Because of the blade being so thin and flexible it’s perfect at doing so. I'm very happy with this Ateco small tapered spatula. It is very easy to use. The handle is wooden and the spatula is stainless. This spatula is perfect for getting into small spaces when icing cakes. Solid, simple icing spatula. 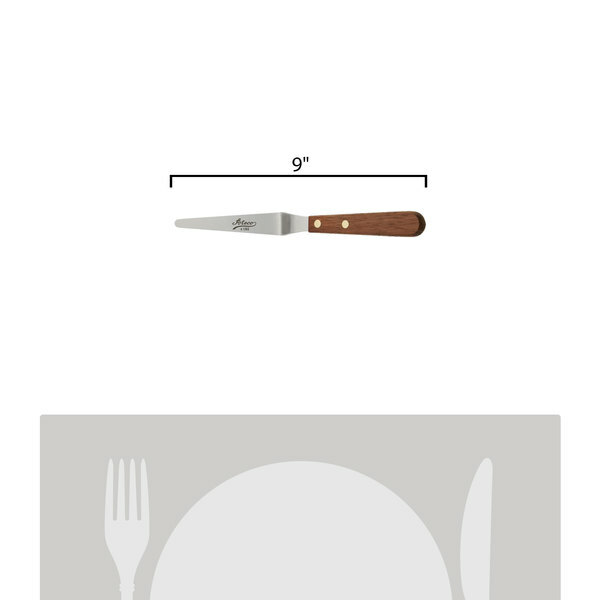 Perfect for 8-10 inch round cakes - you might want something larger if baking a half sheet or full sheet. Additionally, a sticker placed on the blade was difficult to remove completely, as it left slight adhesive residue. I love this great little tool for decorating cakes. It's helpful for creating small details, or for correcting small mistakes. Definitely a great addition to my toolbox. This small tapered offset spatula is a wonderful tool in our bakery kitchen. Used for especially detailed icing and spreading jobs we are thrilled with the quality. This is a great little spreader for small, detail work. I like that it tapers at the end making it easier to get into corners. This spatula is great for frosting cakes or cookies. The tapered edge helps when working with delicate designs. The blade is stainless steel, and clean up easily and holds it's edge well. This tool is nice quality, sturdy handle, well made steel and size works great for frosting mini cupcakes! A great addition for any home or bakery. So glad I finally ordered this! Huge difference in the way this handles compared to the regular spatula. It feels less clumsy and really makes icing cakes a breeze. This spatula is amazing. It did great job on my heavy whipping cream cake with its high quality. The size is also perfect. I would recommend this to any cake baker. Offset spatula, perfect for frosting cakes as well as for spreading things like mayo on bread. Nice wooden handle and a decent blade as well.